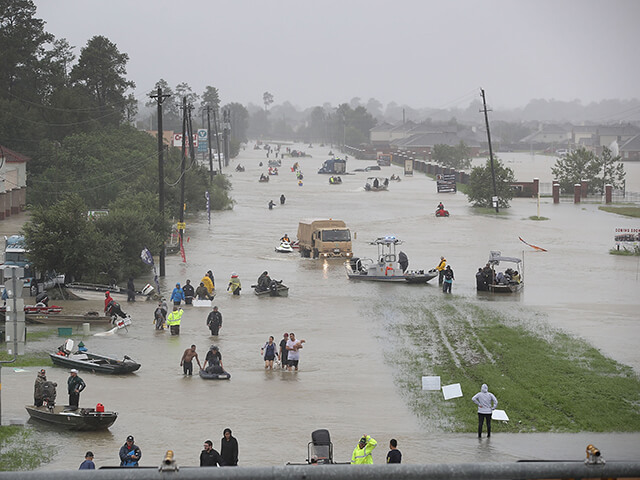 Hurricane Harvey hit the Texas Gulf Coast on August 25, bringing epic flooding to the city of Houston and southeast parts of the state, as well as southwestern Louisiana. As many as 70 people died as a result of the storm. At an estimated cost of $180 billion, Harvey will likely be the most expensive natural disaster ever in the history of the United States. Harvey was a category 4 hurricane when it made its first landfall at Port Aransas and Port O’Connor, just north of Corpus Christi. The brunt of the storm’s 130 miles per hour winds hit coastal areas, but it was the rainfall that that did the most damage—as trillions of gallons of water deluged southeast Texas. Topping 51 inches, it was the heaviest rainfall ever from a single storm in the continental United States. As Texas and Louisiana were beginning to recover from the deluge, Hurricane Irma arrived to wreak devastation on Florida, after first pounding several Caribbean islands. Irma knocked out power to millions of Floridians, and storm surges flooded Jacksonville, Miami, and other coastal cities. Key West, Ft. Myers, and Naples were among the hardest hit. At least 40 deaths were attributed to the catastrophic storm. At one point, Irma was the strongest Atlantic hurricane ever recorded by the National Hurricane Center. But it weakened prior to landfall, and its destruction won’t rival Harvey’s. The scale of the flooding in Houston brought comparisons to New Orleans in 2005 during Hurricane Katrina. But New Orleans received only about 5 to 10 inches of rain in a 48-hour period. Most of the flooding there was caused primarily by the storm surges that breached levees. The rainfall in the Houston area was many times heavier, though the death toll for Katrina was far higher. Some mind-boggling facts about Hurricane Harvey: during one 36-hour period, an estimated 9 trillion gallons soaked Houston and its environs. That’s enough to fill the Great Salt Lake twice; or 14 million Olympic-sized swimming pools, or 33,000 Empire State Buildings! At the peak, an area the size of the state of New Jersey was underwater. To many observers, the real story of a monumental disaster like Harvey is not the damage done but the courageous, selfless actions of first responders. The U.S. Coast Guard together with state and local emergency-response teams and citizen volunteers worked around the clock to rescue people stranded in homes or vehicles. Crucial aid was provided by the so-called Cajun Navy, which brought fishing boats and navigation skills to the rescue effort. Some 20,000 people were pulled from the floodwaters (along with 1,500 pets). A press release from FEMA assessing damages and the recovery effort. A thorough assessment of damages from Hurricane Harvey; includes emphasis on climate change as a contributing factor. Satellite imagery of flooded areas in southeast Texas. Health- and safety-related tips and guidance on what to do or not do in the aftermath of a hurricane from the CDC. The fact-checking site takes on wild claims about Hurricane Irma. Analysis of claims made about the role of climate change in recent hurricanes.